UPDATE: Daily Mission #15 is now available! Get ready for our next epic mission marathon. Starting from 12th March onwards, we'll be releasing a new mission filled with different objectives and rewards daily until the 27th. Why participate, you ask? Simple: this series of chained missions will also serve as the debut of a new tank: the T25 Pilot. This new American medium tank shares many similarities with the T26 Pershing. They look quite alike for instance, and they possess the same advantages as well - good elevation angles, strong turret armour and a steady gun. On the other hand, both vehicles also feature a moderately weak hull armour and somewhat unreliable armour penetration. But that doesn't mean the T25 is a direct clone. This vehicle isn't quite as agile and has a slightly poorer view range, but it makes up for that by having a faster top speed and a generally more effective gun than the Pershing. Throughout this mission marathon, you'll be presented with a new mission everyday, with entirely different objectives for each mission. Completing a mission will also earn you various minor rewards as well, from consumables to in-game currency. 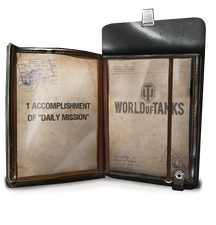 Each completed mission will also give you an invisible token that counts towards the goal of earning a T25 Pilot. When you complete 13 missions, you will receive the tank as a reward. There are a total of 15 missions to attempt. As such, there is no need to complete the missions in chronological order to get the tank. Missed a crucial mission or just can't find the time to attempt enough of them? The Premium Shop is your answer. While the mission marathon is active on the servers, we'll also have 3 separate token packages available on the Premium Shop. When purchased, each package will credit you with 1, 5 or all 13 required tokens in your account respectively. Players will not receive any mission rewards when purchasing a token package. Any leftover tokens after the T25 Pilot as been successfully redeemed will be refunded to the player as in-game gold soon after the package purchase. Any purchased tokens that still fall short of the required amount needed for the T25 Pilot will be refunded to the player entirely at the end of the mission marathon event. For example, if a player purchases 8 tokens and did not complete any missions, all 8 tokens will be refunded eventually. Players will be refunded at a rate of 1 Token :600. Collect 13 'T25 Pilot Marathon' tokens. Note: This mission is only available from 12th to 13th March. Win 5 Random Battles while being in the Top 10 for EXP earned. Note: This mission is only available from 13th to 14th March. Destroy 10 enemy vehicles in any number of Random Battles. Note: This mission is only available from 14th to 15th March. Deal 15,000 damage over any number of Random Battles. Note: This mission is only available from 15th to 16th March. Earn 20,000 EXP over any number of Random Battles. Note: This mission is only available from 16th to 17th March. Win 10 Random Battles while being in the Top 10 for most damage dealt. Note: This mission is only available from 17th to 18th March. Play 10 Random Battles. Players must deal 2,000 damage in a battle to count. Note: This mission is only available from 18th to 19th March. Play 20 Random Battles while being in the Top 5 for most damage dealt. Note: This mission is only available from 19th to 20th March. Win 10 Random Battles while being in the Top 3 for most EXP earned. Note: This mission is only available from 20th to 21st March. Be in the Top 1 in your team for most damage dealt in a Random Battle. Note: This mission is only available from 21st to 22nd March. Win 10 Random Battles while being in the Top 3 for most damage dealt. Note: This mission is only available from 22nd to 23rd March. Deal 50,000 damage over any number of Random Battles. Note: This mission is only available from 23rd to 24th March. Win 10 Random Battles while being in the Top 5 by EXP earned. Note: This mission is only available from 24th to 25th March. Destroy 30 enemy vehicles over any number of Random Battles. Note: This mission is only available from 25th to 26th March. Complete 10 Random Battles. Players must destroy at least 2 enemy vehicles for a battle to count. Note: This mission is only available from 26th to 27th March. Complete 3 Random Battles. Players must be in the Top 1 for EXP earned for each battle to count.